Last month I presented some Christmas customs celebrated in France. One of the main ingredients of a celebration, it seems, is food. 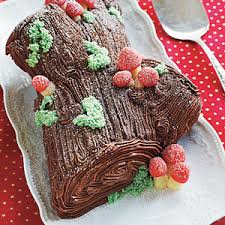 Here is the recipe for Chocolate Buche De Noel, Christmas Yule Log cake, a must to finish off a French Christmas meal. Preheat the oven to 400 degrees. Butter a 10-inch by 15-inch baking pan with a 1-inch lip (jelly-roll pan) and line it with parchment paper. Butter the parchment or spray it with cooking spray. Set the pan aside. Beat the eggs for 5 minutes, until they turn thick and foamy. Add the sugar, vanilla extract, and salt to the eggs and continue beating for 2 minutes. Fold the flour, a few tablespoons at a time, into the whipped egg mixture. Once the flour is incorporated into the batter, stop mixing. Do not over mix or the cake will bake up into a tough texture. Gently spread the batter into the prepared pan. There will be peaks of batter; gently smooth over them, but do not press the batter down. Bake the cake for 10 minutes, until the cake is just set. Invert the baked cake onto a clean, dry kitchen towel and peel off the parchment paper. Wait 3 minutes and then gently roll the cake, still in the towel, starting at the 10-inch end. Allow it to cool completely. In a clean, completely dry bowl beat the egg whites on high until soft peaks form. Set them aside for a moment. In a small saucepan, bring the sugar and 2/3 cup water to a boil. Allow it boil until it has reduced into a slightly thickened syrup. Begin beating the egg whites on high speed again, and pour the hot sugar syrup into the eggs in a slow, steady stream. Pour the melted chocolate, espresso powder, and vanilla extract into the egg whites and continue beating them until the meringue has cooled completely, about 5 minutes. Add the softened butter to the meringue, 2 tablespoons at a time, while beating on high speed, until all of the butter is incorporated into the frosting. If the buttercream becomes runny at any time in this process, refrigerate the meringue until it has chilled through and continue the process of beating the butter into the meringue. Unroll the cake and set aside the towel. Evenly spread 2 cups (or desired amount) of the chocolate buttercream on the inside of the cake and following its natural curve, gently form it into a cake roll. Cut off the ends of the cake roll on the diagonal and reattach them in the center of the cake with a bit of buttercream to fashion a “branch” coming off the main Yule log. Spread the exterior of the buche de noel with enough chocolate buttercream to cover it and gently pull a butter knife or small, offset spatula through the frosting to give the appearance of rough tree bark. Add a Pere Noel figure and meringue mushrooms to complete the festive look. Chill the cake before serving it, and refrigerate any leftovers. This chocolate yule log recipe makes 14 servings. Next month I plan to share the Christmas customs of Denmark. 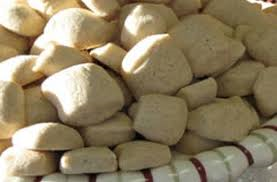 To spark your interest here is a recipe for a Danish Christmas cookie, Pebber Nodder. 2. In a large bowl, mix together the butter and sugar until smooth. Beat in the eggs one at a time, stirring until light and fluffy. Combine the flour, cardamom and cinnamon; stir into the sugar mixture just until blended. 3. Separate the dough into 6 balls, and roll each ball into a rope about as big around as your finger on a lightly floured surface. Cut into 1/2-inch pieces, and place them on an ungreased baking sheet. 4. Bake for 10 minutes in the preheated oven, or until lightly browned. Cool on baking sheets for a few minutes, then transfer to wire racks to cool completely.